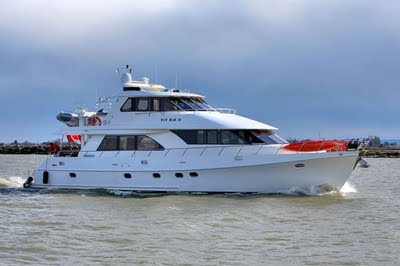 Motor Yacht TOY BOX II is available for bareboat charter in British Columbia, Canada. The original owners rarely used the yacht. The current owner acquired her in late 2009 and in 2010 added a hot tub, new ultra-quiet generators, and fitted all new main salon furniture. TOY BOX II has very high headroom, and the massive windows provide exceptional views. When the tender is launched, custom railings are placed around the Upper Deck and a cover can secure the stairs down to the aft cockpit, making the aft deck a safe and comfortable guest area. Master stateroom with King bed and 2 ensuite bathrooms, 1 with oversize shower and the other with full size jetted soaker tub. 2 VIP staterooms, each with Queen bed and ensuite bathroom.